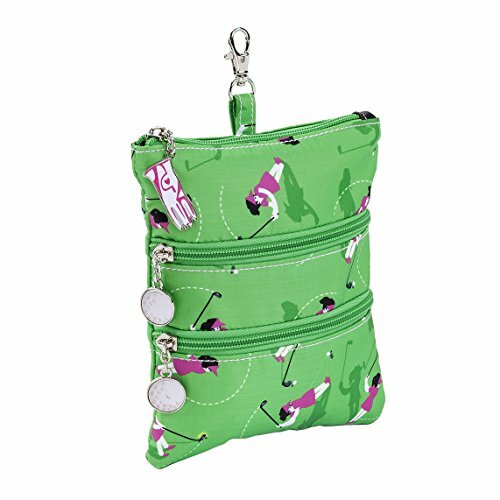 Hit the green in style & keep your accessories close at hand with the Sydney Love Sport clip on zip pouch. Part of the Swing Time Golf Collection. Clip-on zip pouch in printed water resistant light weight nylon. Features all over swing time golfer print. Two Exterior zip pockets Golf charm zipper pulls. Top zip entry. Lined. Top clip to attach to larger bag. If you have any questions about this product by Sydney Love Sport, contact us by completing and submitting the form below. If you are looking for a specif part number, please include it with your message.